Finland: The soviet relief fights its way north eliminating the German infantry cadre and although the Germans straddle the rail line immediately to the south of Murmansk the city is back in supply. To the north of the lakes both sides lick their wounds without combat. Leningrad Front: The Soviets strike back recapturing last turn’s lost advance cadreing a Pz and reinforce the spearhead with copious amounts of DAS. They also expand their attacks immediately west of Pskov and place an attack force ready at Narva. At Kalinin the forces on the German left flank fall back leaving a token fortified division as rear-guard. On the Germans right forces are reinforced and troops slip past the German spearheads to temporarily put them out of supply. Moscow Front: The Soviets cannot re-take the city but the trapped forces in Moscow West strike SW and link with troops fighting directly west. They cadre a 11-10 pz and link up placing Moscow West back in supply. Voronezh Front: The main assault plough on the centre 7 attacks are lunched and while 4 result in NEs the rest inflict massive damage. An attack lead by Guards cavalry penetrate a indent in the Axis line and a left hook eliminates an entire infantry corps of 3 divisions whose cadres have no retreat. At Kursk a scratch defence of cadres and security division is eliminated while just south of Tula a 9-10 pz is cadred. All for the loss of 9 points in a HX. 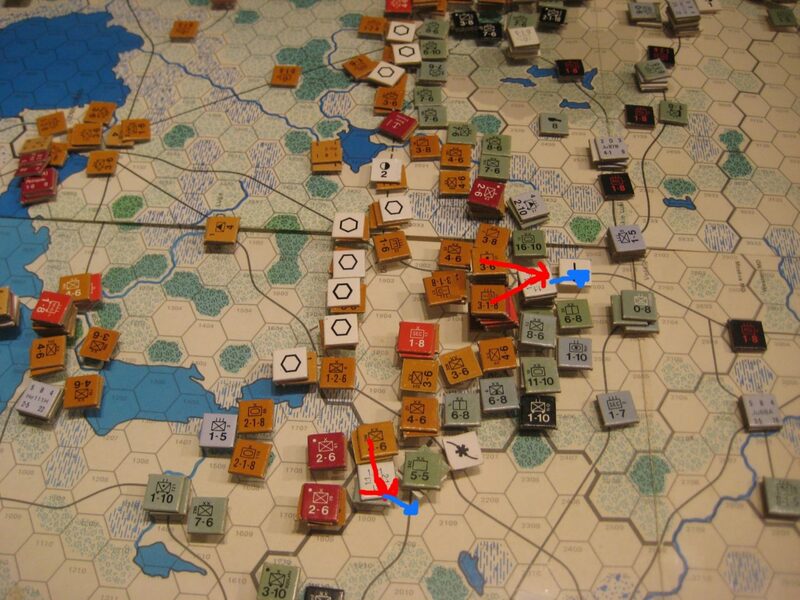 Soviet Mar I 42: Battles of Attrition along the Central Front. Crimea and Odessa: Odessa receives 10 factors of supply by air and accumulated Inf Reps replace isolation losses. From Kerch a rather belated attack cadres the lone 7-6 infantry division guarding the peninsular but a Guards Cavalry is cadred in the exchange. 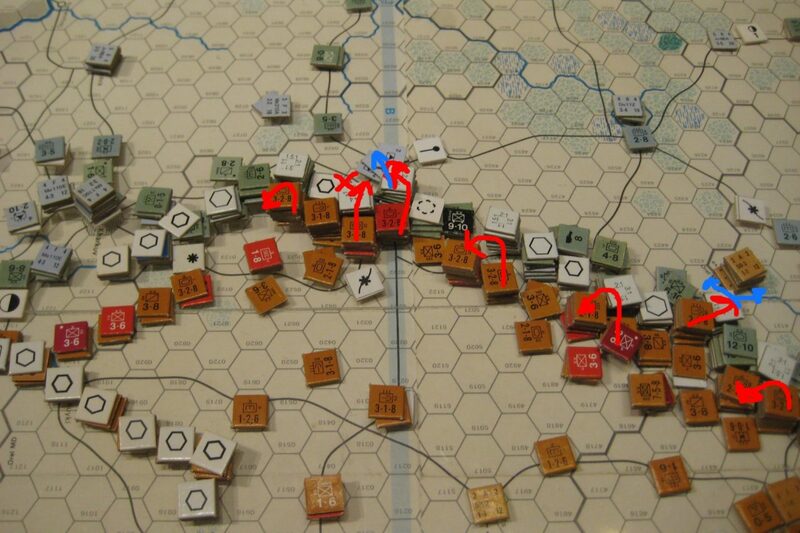 Air War: Nursing their losses from last turn the Soviets send some long rail bombing raids out for little real impact. DAS reinforces the defenders falling back from Kalinin. One raid is mounted against an undefended stack of Heinkels at Zaporozhe with 5 of the 6 raiders being returned by AA fire and no effective bombing factors delivered.